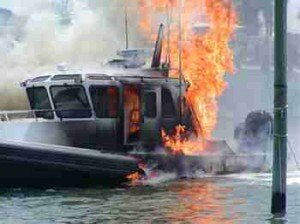 Over the past 25 years we have seen many boats catch fire and burn for one reason or another, in many cases the reason for the fire is unknown. We recently had a claim where a boat burned to the waterline; the reason for the fire was attributed to electrical failure. During the claim investigation, it was discovered that a fuse had blown in the automatic battery charger and instead of replacing the fuse with the proper replacement, the owner wrapped the blown fuse in aluminum foil and placed it back into the fuse holder. This rendered the fuse (overcurrent safety device) worthless which created all kinds of problems. One of the batteries had a bad cell which caused the automatic battery charger to sense low charge, and run continuously, which cooked the other batteries. The continual running of the charger on full drew too much amperage over an extended period of time through the supply wire leading to the charger, causing it to overheat and fail. We are not sure which of these problems actually started the fire, but the combination leads us to believe that the improper fusing was ultimately responsible for the fire. This is an extreme example, but the fact remains that overcurrent devices are intended to provide protection for the supply wire and the electrical equipment they are designed to protect. Exceeding the equipment manufacturer’s recommended fuse rating, or maximum amperage rating of the supply wire, will result in failure of the fuse to protect your electrical equipment properly and could result in fire aboard your vessel. Along the same line, in surveyor reports we often see the presence of overrated fuses or fuses marked “SFE” which are intended for automotive usage, installed in a marine fuse panel or electrical equipment fuse holders. Fuses marked “AGC” are intended for marine use. The amperage rating of an SFE fuse is in direct relationship to the physical length of the fuse, the longer the SFE fuse the higher the amperage rating. A fuse marked AGC has a specific (unchanging) physical length. The amperage of the AGC fuse is determined by the size of the fusible metal strip inside the glass, not the physical size of the fuse itself. Because the size (length between contacts) of the fuse holders in marine 12vdc electrical fuse panels, fuse blocks or in line fuse holders are maintained at a constant, it is important to use AGC fuses. Use of AGC fuses allows you to complete the circuit and provide protection at the recommended amperage. Note: Your primary automatic bilge pump (the pump located where sea water typically gathers) should be wired directly to a 12vdc power source. Secondary automatic bilge pumps should be wired and fused independently of each other to avoid multiple failure. Note: Amps = watts divided by volts. Fuse size should not exceed 125% of the total load or the current carrying capacity of the conductor (ampacity).